We had the privilege of meeting Chef Aaron J. Perez recently and immediately understood why he is quickly becoming a top chef in LA and beyond. For Chef Aaron J., who was born and raised in Boyle Heights, Calif., near the famous El Tepeyac Restaurant, a career in culinary arts did not even come into the picture when he thought about his future. After graduating Bishop Mora Salesian High School in 1998, Chef Aaron J. made some wrong choices in his life and despite his struggles he overcame them with trial and error, he says. While sitting at his mom’s house he saw commercials for culinary school. A light bulb switched on and instantly Aaron J. knew he wanted to become a chef. He enrolled at the Le Cordon Bleu School of the Culinary Arts in Pasadena, CA, and is now a graduate and a member of the American Culinary Federation since 2008. 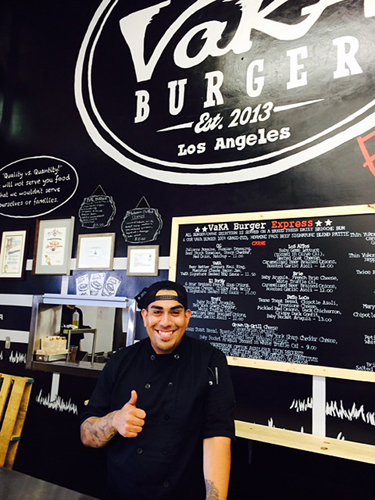 Today, he has a thriving catering business and is the owner of Vaka Burgers. He has a son and wife, Esmeralda Y. Sanchez, who is also his business partner. Chef Aaron J. is making his mark in Los Angeles not only as a businessman but as a philanthropist by donating a substantial amount of time and talent to local organizations. We had a chance to catch up with Chef Aaron J. as he was driving to downtown Los Angeles to shop for upcoming events. Hope he inspires you as he has LatinoFoodie. 1. What inspired you to go into culinary arts? I always cooked with my mom in the kitchen. Traditional dishes like enchilada casseroles. She would make a dish and I would try to make it all nice on the plate. Even if it was a quesadilla, I would stack it up. 2. On your website and Facebook page, you reference that growing up in Boyle Heights had some challenges. How did you overcome them and stay focused on your dreams to be a chef? I loved culinary school and appreciated the chefs who saw something different and gave me a lot of faith. Culinary gave me self-esteem and pride especially when I made a good dish. I found my identity and something I was good at. I constantly worked and gave it 100%. 3. We noticed you have some great tattoos on your arm. LA Weekly wrote a feature on local chefs with tattoos. What are your tattoos and are there any culinary images? I have a chef’s knife on the back of my ear. Although at times I get weird questions and people are asking what it means. I have tattoos of the Aztec and Mayan culture, and a version of a Michael Angelo piece of the Virgin Mary, which most of my art work comes from well know tattoo artist, such as Kat Von D. It’s not spiritual but you could say maybe more “protective” images, though I have always had an appreciation for art in itself. 4. We see you are helping local Latino organizations like Self Help Graphics & Art, which we think is amazing. Why is giving back to the local community important to you? I am a strong believer in giving back. I have the opportunity now. I have partnered up with Girls Today Women Tomorrow Leadership Mentoring Program, Inc., located in East Los Angeles, near the Mariachi Plaza. The organization has a mixture of mentoring programs and personal development activities that connect the girls to mature adults who serve as role models and mentors. I have been given this awesome opportunity in helping design and be the official spokesperson for the GTWT Professional Teaching Kitchen for broadcast television. 5. You have worked as a food stylist for some well-known celebrity chefs and restaurants, from Wolfgang Puck, Bobbly Flay to La Cachete. How would you describe food styling to our readers? I would consider food styling an art. The plate is the canvas and you are using food to tell a story. Color is a big part of it. It’s very tedious work. We just did a photo shoot for my portfolio and it took 10 hours to shoot six dishes with our photographer Kenny Sanchez, also from Boyle Heights. It has to look appetizing to a person who can’t taste it. 6. Who was your greatest cooking influence? I love Anthony Bourdain. I love his story. Tyler Florence, Eric Ripert and Bobby Flay. You can tell that they love what they do. 7. What is your favorite Latin-inspired dish that you like to prepare? I love to do enchiladas or things that my mom would have made. Instead of frying in vegetable oil I will use grape seed oil. I try to put my own spin on the traditional dishes and introduce organic, fresh ingredients to make them healthier. 8. What’s the next big thing in Latin cuisine? Upcoming trends? I see a lot of fusion food, using different cultural influences to make up one dish. A lot of people are doing tacos but with different variations. Another trend I see is that people are trying to cook healthy food and substituting ingredients to make it healthier and better. 9. What would be your last meal? My last meal would be a prime cut of filet mignon with a brandy reduction sauce demi glaze on a bed of truffle mashed potatoes and asparagus.